Nokia’s upcoming Penta-camera smartphone has been on the rumour mill for around a year. 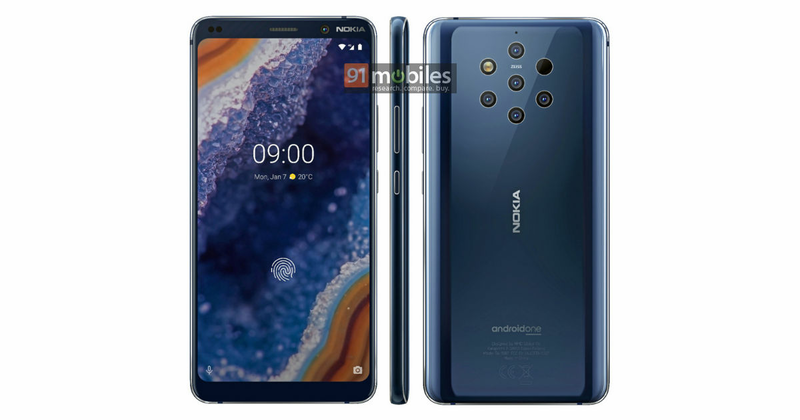 But as we head on towards a flood of smartphone launches at MWC 2019, the Nokia 9 PureView has received its FCC certification. Nokia will also be present at the global Mobile World Congress 2019 and there will be a lot of attention towards its announcements as the majority is expecting the flagship to get a curtain raiser at the show. Thanks to the FCC documents, we now know some things for certain about the eye-catching Nokia flagship. As per the FCC listing, Nokia is expected to oust three models of the Nokia 9 PureView. Those include a single SIM model (TA-1082) that will be limited to the US. An Android One version (TA-1087) with dual SIM for the rest of the world and a dual-SIM variant (TA-1094) without Android One for China. Moreover, it seems that Nokia isn’t giving 5G much serious thought for now, as there’s no 5G support on the Nokia 9 PureView. Connectivity options include dual-band 802.11a/b/g/n/ac Wi-Fi, Bluetooth, LTE, NFC, and support for ANT+. Besides the above-mentioned info, the FCC listing confirms the design of the handset that has leaked so many times in a previous couple of months. When it comes to internals, the Nokia 9 PureView isn’t likely to come with the latest silicone as there have been long-standing reports of a Snapdragon 845 SoC. However, there could be a Snapdragon 855 variant later in the year. The handset will have a 5.99-inch 2K display with HDR10, an on-screen fingerprint reader, and at least 6GB of RAM. There will probably be more than one variants with varying prices but that will only be known later on. HMD Global’s event is set to take place on February 24th and it will be an interesting two weeks with many launches coming up in a short span of time.